Solomon Mason proved you’re never too old to go to summer camp. 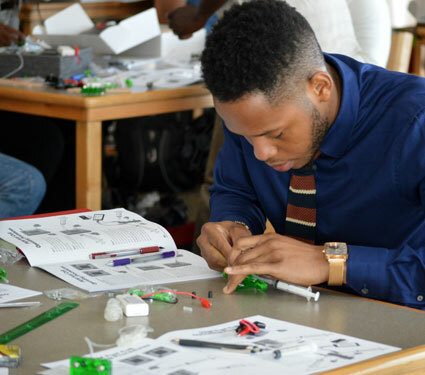 The senior mechanical engineering major joined fellow NIU students Dwayne Wilson, David Duncan, Nkem Ekhator, Sheriff Otun, Victor Aghadi and Stella Aghadi from July 5 to July 24 at The Summer Engineering Experience for Kids (SEEK) program held at Miles Davis Magnet Academy in Chicago. 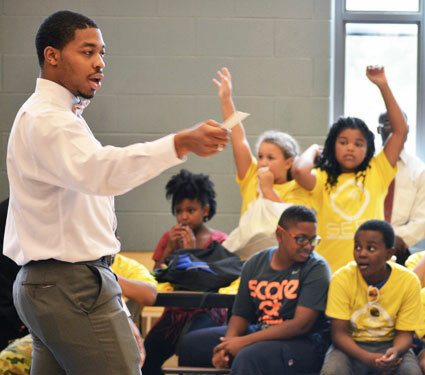 According to the NSBE website, SEEK is designed to be a fun and engaging educational experience for students in third- through eighth-grade. Led by college engineering students and technical professionals, students work in teams, using their knowledge to solve problems and create products while discovering the underlying math and science principles involved. During the free three-week program, teams take on a new project each week which culminates with a presentation, design competition and physical competitions that all parents are encouraged to attend. Since starting in 2007 in Washington, D.C., SEEK has served more than 3,500 students in 14 cities across the United States. Mason became a mentor last year after hearing about it at an NSBE convention, and returned to camp in 2015 as an administrator. For both students and volunteers, it was a summer camp experience they will never forget.